We supply recycled polyester fibers from india. Our product range from 1.5 denier to 15.0 denier. Cut-lengths are 32mm, 44mm, 51mm, 76mm and 102mm. 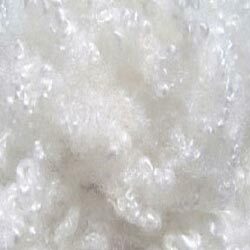 We supply solid fibres in white, black and certain bright colors. Also, we supply hollow silicone and hollow non-silicon in 6d and 15d in 64mm. Packaging Details About 300 Kg of fiber packed in Bales and wrapped with HDPE sheet and tied with PET Strap.